Following the direction of the 2014 levy approved by voters, the Centerville-Washington Park District is systematically replacing older playgrounds. We celebrated the latest upgrade at Iron Horse Park Thursday, November 2 from 4:30 to 6 p.m. with a free event for the community. The event included a short ribbon-cutting, storytimes, popcorn and the chance to be among the first on the new playground! The “Pop Over to the Park” event also celebrated the addition of the third Little Free Library in a CWPD Park. The Iron Horse Park Little Free Library is a partnership with the Friends of the Washington-Centerville Public Library and was made possible through donations from the Centerville Rotary Club and Patrick Hansford. A Little Free Library is a collection of books where anyone may stop by to pick up a book and leave behind another book to share. Introduced in Wisconsin, Little Free Libraries have turned into a worldwide book sharing movement. 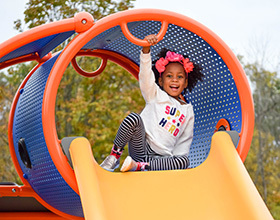 The park’s new playground is larger than the previous playground and features an all-weather, all-accessible safety surface. This type of surface has been well received by children and parents at CWPD’s Activity Center and Robert F. Mays Parks. Not only does it meet safety requirements, but it’s easy to walk on and accommodates wheels. Play features include swings, an adaptive swing chair, a wheelchair-accessible whirl spinner, various climbing structures, slides, platforms, and a spinami. Because residents have requested more shade in the parks, the new playground also includes a colorful shade structure!